This fine art print of Marion Billet's iconic London characters in uniform has been created on a traditional 4-color proofing press, printing directly onto art-quality paper. 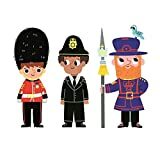 Featuring a Queen's Guard, a policeman, and a beefeater (plus pigeon), it comes complete with a beautiful card mount and a certificate of authenticity. Capital stuff for all London fans—especially the little ones! Also available: London Bus print.